Action for Healthy Kids and Colorado PTA are working with 20+ school parent groups in 2018-19 and 2019-20 to promote healthy lifestyles and increase academic achievement. Selected groups receive a wellness project kit valued at up to $1,000, along with coaching, training opportunities, and resources to help implement a successful nutrition or physical activity project that engages students and families. – Hosting a tasting event for up to 500 students with the Taste Test & Nutrition Promotion Kit. – Supporting a cooking class, club or family event with the Healthy Cooking Kit. – Enhancing your school’s indoor or outdoor recess options with the Active Recess Cart. – Incorporating the Healthy Games, Celebrations & Rewards Kit into your student celebrations and rewards program. 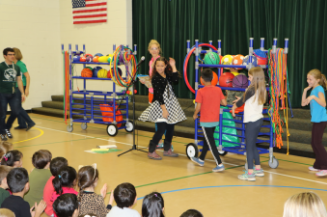 – Bringing more movement to the school day with the Classroom Physical Activity Kit. For eligibility guidelines, program requirements and information on how to apply, contact Colorado AFHK.